Glens Falls, N.Y.—Jane Peterson (1876-1965) was born to Scandinavian immigrants in a Midwestern town just a decade after the Civil War. Ideas of women pursuing higher education and even careers were just gaining traction when the 1893 Columbian Exposition in Chicago featured The Woman&apos;s Building. There, the teenager saw paintings by Mary Cassatt (1844-1926) and Mary MacMonnies (1858-1946), and likely learned about the growing women&apos;s suffrage movement. Inspired and with her sights set on a career as an artist, Peterson ventured to New York City and enrolled at the Pratt Institute. She went on to travel the world, befriend major artists of the time, earn a generous living, and build a life as a modern career woman. Her accomplishments are examined in Jane Peterson: At Home and Abroad, an exhibition opening Sunday, August 5, at The Hyde Collection. With more than eighty paintings and select memorabilia, the exhibition follows Peterson&apos;s travels, her journeys through art movements, and the way she forged a path as an independent woman in a changing world. The exhibition includes works from her travels in Europe, North Africa, and at home in the United States, beginning with her introduction to Impressionism. Peterson studied with Frank Brangwyn, Jacques Blanche, Andre L’Hote, and Joaquin Sorolla, who greatly influenced her. She painted with John Singer Sargent, Childe Hassam, and Maurice Prendergast. She traveled extensively with Louis Comfort Tiffany, and socialized with such artists as Pablo Picasso and Henri Matisse. Peterson enjoyed great success throughout her career and was extremely popular among major art collectors of her time, especially John D. Rockefeller. Her works are included in museums including the Metropolitan Museum of Art, the National Museum of Women in the Arts, the Pennsylvania Academy of Fine Arts, and the Philadelphia Museum of Art. Jane Peterson: At Home and Abroad runs through October 12 in Wood and Feibes & Schmitt Galleries. A companion exhibition, Changing the Landscape: Women Impressionists from the Thomas Clark Collection, also opens August 5 and sheds light on the works of twenty-one lesser-known turn-of-the-century female artists. In the early part of the twentieth century, art gave American women opportunities they hadn’t known before. Focusing on landscapes, this exhibition includes works from artists trained in Boston, New York City, Philadelphia, and Europe. 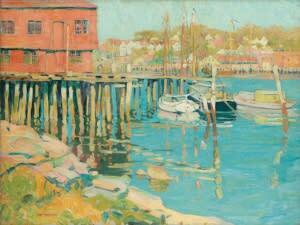 Many studied under the likes of William Merritt Chase, Henry Twachtman, and Frank Duveneck. The exhibition is drawn from the collection of Thomas Clark, who has one of the finest private collections of American Impressionist art in upstate New York. The collection includes excellent examples from artists who emerged during and after the American Impressionist movement at the turn of the twentieth century, all of whom were contemporaries of Jane Peterson. Changing the Landscape: Women Impressionists from the Thomas Clark Collection runs through October 21 in Whitney-Renz and Hoopes Galleries.